I must be the only blogger who has readers who equate GM’s bankruptcy with Mikuru’s (lack of) melonpan. The issue really is if Mikuru needs some government-backed bailout of her melonpan. I say “yes.” She’s getting trounced this season by pretty much everyone except Horo~n. air: Each one of these episodes seems to have been drawn by a different team. Episode 4 the K-ON staff. I guess they all want a piece of the trolling action. I think the bigger issue is that Kyoto is forgetting who they brought to the dance. My biggest issue is that they stubbornly refuse to do what they did to make Fumoffu and Haruhi originally so enjoyable: keeping it simple and piling on fanservice. There was an entire episode of Fumoffu that revolved around clothing that dissolved! Can you imagine 2009 Kyoto doing something like that? The anime blogging equivalent, of course, is if blog好き became too highbrow to moe at meido and barnacle-avoiding bassists. Yes, it goes on and on my friend. I wonder how many people got that you wrote that in poetry. I wrote about the car flag-waving Haruhi fans back before any reboots happened, and I feel so totally vindicated now. The bandwagon fans were defending the reboots and now they are raging about it. After writing this blog for seven years, I know that most people cannot rationally judge an anime. So be it. There’s nothing wrong with it. So what if I like Umineko and Princess Lover because there’s meido in them? But I’m not going to pretend that Umineko isn’t yet another show that’s going to be butchered by Studio Deen or that Princess Lover is yet another generic harem series. It’s not really the prejudice when it comes to anime… it’s the perspective. She looked like Mio with shorter hair… is that what you’re trying to get at? 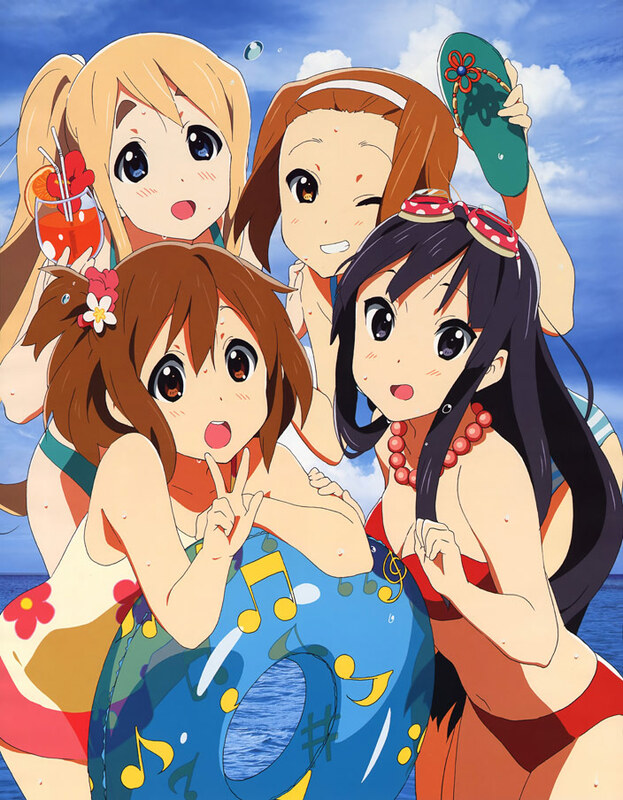 torinostu351: Funny about the K-ON! references, I actually though Haruhi had a lot of Mio facial expressions, like her “confused but somewhat interested in what your going to say next”. (Or maybe I’m just desperately missing Mio.) In fact, I think Haruhi was cutest in this episode. And for me personally, I’m enjoying this. But now I see why it took so long to get this show aired. Every time they animated it, the crew quit, then they had to spend a few months hiring them all back, just to reanimate the same show again. Having not read the novels, I’m excited to see where this all goes. And Jason, stay the course . . . we’re all right here with you. I like how Haruhi is surpassing Mikuru in terms of moe due to Mikuru’s shrinking melonpan and Haruhi’s now Mio-like features. 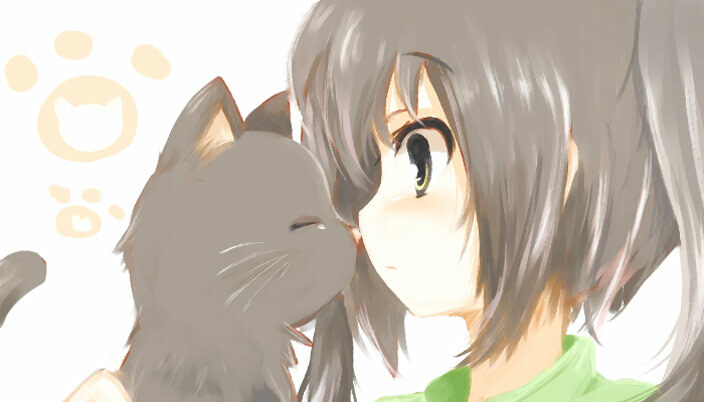 But we all miss Mio… I think the next countdown won’t be for Indignation of Haruhi Suzumiya but for K-On! Encore. I mean… lesbian stalker for Mio, a Kyoto class trip where Mugi and Mio take a bath together, a “training” session for Mio that involves meido, and the Sawa-chan Meido Fuku Mark II… just a murderer’s row of stories. I just hope that when K-On! Encore comes, they won’t replace Don’t say “lazy” with something that induces seizures. Mr Jones: Worst possible outcome: Fans will deny that there was ever a second season at all. It’s more likely that they show all eight and fans bicker about which episode was the one that wasn’t worth deleting. If you’ve seen one, you’ve seen them all–but which one? Best outcome: Kyoto denies there were any more than one “endless eight” episodes, gives us seven bonus episodes for being a good sport. You’re a better man than I for slogging through this. If I can make it through Mai Otome, I can make it through anything. But I don’t agree with either of your scenarios: worst possible outcome is that fans riot and Kodansha pulls Haruhi Suzumiya from Kyoto and gives it to… drumroll… Studio Deen! Best possible scenario is at the end of episode 14, there’s an ad, much like for Gundam 00 Jupiter, that just shows five instruments: two guitars, one bass, one keyboard, and set of drums with “2010” written underneath with a little mini-top hat on the “2”. boo: Might be just me, but I don’t see to be bothered by the reboots at all… Could be my horrible memory making me able to enjoy the episodes each time lol It’s like I forget all the recurring parts, but remember all the bits that show up only once. Boo, it’s called “rum”. I liberally use it too. Niles: I’m in despair that Gonzo nabbed the animation production privileges to The World God Only Knows! This had better be the fake one, or I will hang myself. Never in a million years did I consider the possibility of Gonzo snatching this- I thought at the worst it would be SHAFT screwing it up with a million camera cuts and dumb references. I just got through the awesome K-ON ripoff chapter, so this even being a possibility is like having my toes smashed with a hammer. You mean the awesome K-On! arc. Only good thing happen when Elysee started playing the bass. The World God Only Knows is the #1 overall draft pick. It’s like Steve Strasburg, Matt Stafford, and Blake Griffen all rolled up in one. Of course, those three went to the Nationals, the Lions, and the Clippers, arguably the three worst franchises of the MLB, the NFL, and the NBA respectively. I still think Kyoto is the best choice for Keima. They can get the moe down, and TWGOK doesn’t rely heavily on fanservice, so that doesn’t accent Kyoto’s current major failing. Plus, I’d love to see Aki Toyosaki voice Elysee with maybe Daisuke Ono as Keima. Hakua… Aya Hirano. And if there’s any studio that can do justice with red fire trucks, I know it’s either Kyoto or Production IG (but since there’s no governmental conspiracies, let’s leave them out). Nexas: The worst/best part about a series starring Haruhi as a semi-lesbian assassin is that while she is winking at Mikuru, she has stuffed in her a frog out fit most likely and already has her to taped to a wall near said stripper pole. Yep… these are my readers. I’m still waiting for the next FMP season, but wholeheartedly I support any new KyoAni work that isn’t another Key adaption. 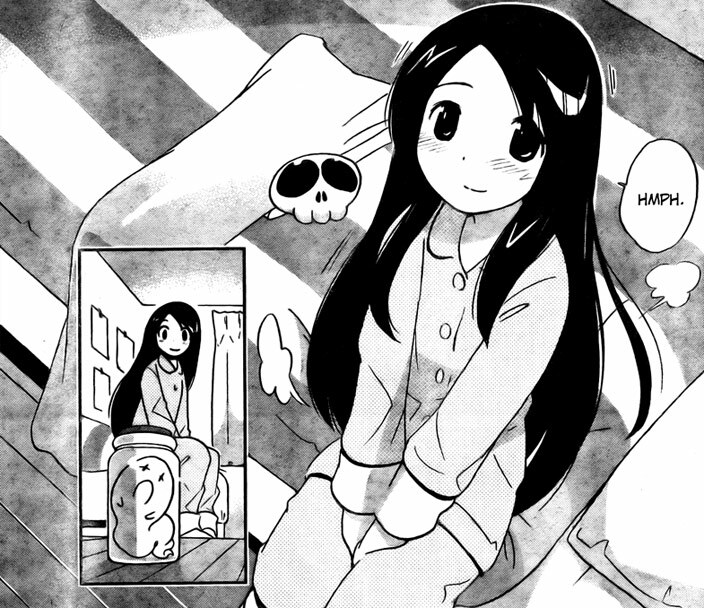 In the DEAD AIR image, does anyone find it odd that Migu seems to be smiling normally? Mio looked scared, Yui looks serious and Ritsu has a confident look like she’s about to beat something down with her drumsticks…so why is Mugi smiling like nothing is happening? Because she’s holding Mio’s hand? Let’s hope not the K-ON crew has a connecting flight from Halifax to Chicago. With the exception of Mugi, no way she’s going on an United flight when she has a private jet available. I’d break Mio’s guitar, if you know what I mean. nora! nora! nora in TWGOK is good! nora! nora! I frakkin’ shivered at this mental imagine. Good grief, I’m so pathetic!! “It’s the song that never ends, it goes on and on my friends. Someone started singing it not knowing what it was, and they’ll continue singing it forever just because, (repeat)”? Am I the only person on this planet who thinks Ufotable is very suited for animating TWGOK? Though I have to admit that as much as I dislike Shaft, it is the sort of thing they’d nab and do a decent job with. A-1 could work as well. >>They can get the moe down, and TWGOK doesn’t rely heavily on fanservice, so that doesn’t accent Kyoto’s current major failing. After getting used to the current cutsey Elsea, it’s a bit of a shock seeing her relatively bursting out of her top in the original one-shot. Doesn’t do it for me. The only person I can see voicing Keima is Lelouch. KyoAni got him on board (briefly) for Kanon, they can do it again. @Neriya: In my opinion, what with the amount of ranting Keima does, I think he is just begging to be voiced by Zetsubou-sensei. pink supervisor 100% for keima. I feel so honored to get the YTAMR this week. poetry? or reference to LAMBCHOP’s THEME SONG??? is there a season two of NEEDLESS?